Always a hit with "non-gamers." Simple to pick up and quick to play. Lots of luck involved, but a great diversion nonetheless. An excellent 2-player card game that’s easy to learn and quick to play. This is a great introduction game for non-gamers, and good filler game for those die-heart gamers. Every time I pulled this game out, it’s been a hit. Everyone wants to play it again. I would definitely recommend this game! Just got to play it recently and I must say I missed a lot for not playing it for the last 2 years. Rules are really simple and the play is intense. It is challenging enough for gamers and fun enough to introduce it to non-gamers. Fast playing, easy to learn, fun, 2-player game that offers a lot more than may seem at first glance. Great for non-gamers - hard to imagine that anyone would not enjoy this one! Everyone I have ever played this game has enjoyed it, its a great game for your fast play collection. My husband and I love this game for its quick play and great blend of skill and luck. 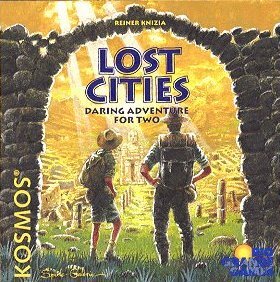 Lost Cities is my absolute favorite 2 player game. It is a game of risk taking and hand management that plays quickly but has surprising depth and strategy. Made by Rio Grande and they fit everything in a neat little box. A must have. Enjoy! A very easy to play 2P game that's good as a filler and to give your brain a rest from the thinking games. I love the artwork on the cards. A quick and fun two player game that was a favorite for a time. The ease of play made this a short filler that would be played multiple times in a row. A great game for someone new to games. Easy to learn and quick to play. I think there's a bit too much luck involved, but the fact that you can always play a revenge match right away makes up for it. This is probably the game I have introduced to the most non-games. It is very simple to learn, has big, colorful cards and plays fast. It may feel very luck dependent, but there is plenty of strategy here. Great little card game. The only complaint I have heard about this game is that the box and artwork makes you believe that there is much more theme to it, while it is really a rather dry game of building numerical chains. I see it more as a push-your-luck game, where the decisions on how many colours to play and when to start them are critical. Good 2-person game that takes 5 minutes to learn. Strategies must change on the fly because of the luck of the draw, just like most card games. A single round can take 5 minutes; you choose how many rounds per game. We don't LOVE the luck factor, but all things considered, a great choice. One of our favorite two player games. Not a perfect game, but it's light, competitive, strategic, and tactical. A lot to fit into a two-player game that won't take up your whole day. Great for travelling, or as a gift to a couple. Even if we don't play for a year, this is a game we hang on to. This game is a blast. The gameplay is elegant and the art is wonderful. Terrific two-player game. My wife loves it, my daughter loves it. Therefore, I love it. Cheers to R. Knizia for this triumph.